Who Should Play Brian Epstein? Who Should Play The Beatles? Curious about any other movie character roles? 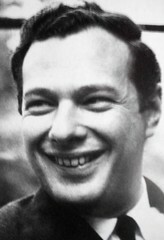 A rare audio recording of a Brian Epstein interview has been provided through The East Coast Invasion - Audiobook. The audio book was released on October 1, 2007, by label: Synergie OMP. Copyright 2007 One Media Publishing. I went to the rhapsody.com link, and you can hear the whole 6:13 interview for free. If anybody has a pop-up stopper, make sure you turn it off, so the site can bring up the window. The interview contains some interesting Q&A. It's also humorous to note: this was recorded around the same time as both Brian & the Boys 'lost their virginity;' courtesy of Bob Dylan.